Coconut flour is generally used as a healthier alternative to traditional grain flours. Our definitive guide will help you understand how coconut flour is manufactured, how it is classified, what are its uses, properties, nutrition facts, health benefits and possible side effects. Coconut flour is obtained after expelling and extracting oil and milk out of the coconut pulp/meat. The remaining of coconut meat is then dried and grounded to make the coconut flour. Coconut meat might be pared and un-pared. Based on its nutritional contents, coconut flour is further sub-classified into: low fat, medium fat, high fat, high protein, and high fiber. Coconut flour is soft in texture and is considered perfect for baking cakes, muffins, and breads. In this method, grinded coconut flour is dried and most of the oil is extracted out of the coconut meat. 88% coconut flour is obtained in this process. Moreover, this flour is rich in protein and low in fats and is considered the best substitute of wheat. High protein coconut flour is best for the manufacture of baking products. In this method, after extracting milk out of the coconut meat, it is then dried and grinded to form coconut flour. Only 52% of oil is extracted out of it. Coconut flour derived from the wet process is considered rich in dietary fiber. 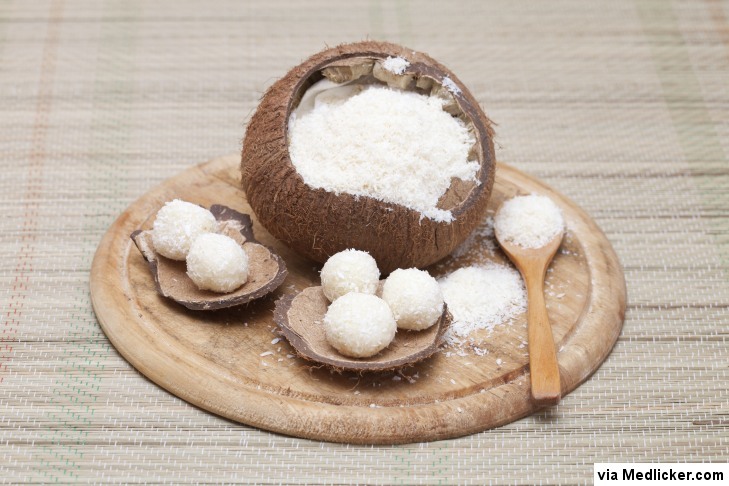 High fiber content of coconut flour made by wet process is helpful in lowering cholesterol and glucose levels. Whole full fat flour: Obtained after pre-pressing unpared and dehydrated coconut kernel. Coconut flour from pared kernel: Coconut flour prepared out of pared and dehydrated coconut kernel. Defatted coconut flour: Coconut meat is defatted through the process of solvent extraction. Flour obtained as the result of this process is brown in color. On the basis of fat presence, it is further classified into: low fat with 10-15% fat, medium fat with 16-25% fat, and high fat with 25-48% fat content. Low fat, high fiber coconut: This coconut flour is derived from the finely grounded coconut flour residual “Sapal”. This type of coconut flour is rich in dietary fiber, which is as much as 60%, and low in fat, ranging from 10-15%. Paring flour: Prepared from the paringand from the testa of coconut. Copra meal: This type of coconut flour is obtained after extracting oil from fine granulated coconut kernel. In the preparation of cakes and breads, coco flour (which is high in proteins) is used as an alternative of the wheat flour, where wheat flour provides less amino acids as compared to coco flour. It is also used in different health programs of nutrition feeding. Coco flour (which is also high in fiber) is usually used in snacks, cookies and breads. Its presence in these items makes it a good source of dietary fiber. Being rich in fiber, it acts as a natural cure for constipation. High fiber content of this flour also makes it an excellent ingredient that can help lower cholesterol and blood sugar. Therefore, if you’re struggling with high blood cholesterol or blood sugar, replacing normal flour with coconut flour may be a good option. As compared to other grained flours, like wheat flour, it is a delicious option with the additional properties of high fibers and low digestible carbohydrates. So, if you are on paleo diet and conscious about having carbs in your diet then coconut flour the best alternative. Baking and frying with coconut flour is definitely a unique experience. It gives a perfect coating for fish, chicken and other protein items instead of corn flour and regular flour. But for best results you need to add equal ratio of liquid into it. With mild scent of coconut, it is found suitable in those recopies where other stronger taste ingredients like cocoa powder or other spices are missing. Light and airy nature of coconut flour makes it suitable for making and baking pancakes, muffins and cakes. Due to its countless health benefits, coconut flour is rapidly replacing ordinary flour in Western food recipes. If you’re conscious about your health and need something to keep you healthy and in shape then adding coconut flour to your diet is a perfect choice. But, why should you go through the length of replacing ordinary flour with coconut flour? Your question is indeed fundamental and here is the answer to your question. One of the basic reasons for replacing other flours like wheat, barley and rye with coconut flour is the presence of gluten in these flours. Gluten is a type of protein molecule that can elicit allergy in sensitive individuals. Celiac disease is a condition where lining of small intestine gets damaged and intestine ceases to absorb food nutrients. Dr. William Davis, in his book Wheat Belly: Lose the Wheat, Lose the Weight, and Find Your Path Back to Health, mentioned that use of wheat flour is not only dangerous for celiac sufferers, but has deleterious effects for average users too. Lethargy, frequent disturbance in bowel movement and allergies are all due to gluten sensitivity, says Dr. William. Although wheat has unhealthy effects on the body, it is an important ingredient of our meals and it is difficult to manage a meal without wheat. Although, there are some possible replacements for wheat flour, like flour obtained from soy, nuts and beans. But, use of these flours has some drawbacks as well. For instance, these flours are very expensive and not as tasteful as wheat flour. What alternative do you have then? The answer to your question is coconut flour. In short, if you are allergic to gluten and want cheap, healthy and tasty alternative to what flour then coconut flour is the best option that you’ve. What makes you gain weight? The answer of most would be “fats”. Yes, fats do make you thick around the waist line, but something that is even more damaging for your figure is sugar. Yes, you’ve read it absolutely right. Sugar causes even more rapid increase in weight as compared to fats. But, here is a catch too! You can’t eliminate sugar totally from your diet, right? That’s never going to happen. The truth is that all sorts of sugar are not bad for health. There are two types of sugars: simple carbs and complex carbs. Simple carbs, as you can infer from the name, are simple in nature and are readily digested and absorbed into the body. When this happens, the blood levels of insulin spike and this is when all problems begin. Insulin starts a cascade of chemical events that turn excess sugar into fat. Complex carbs, on the other hand, have a complicated structure and are digested and absorbed quite slowly. This causes little increase in insulin and the resultant gain of fat is minimal. What makes coconut flour so important is that almost all of its carb content is complex in nature and causes little increase in blood glucose and body fat. In addition, coconut flour is extremely rich in dietary fiber. Fiber is something that keeps your gut healthy and saves you from countless ailments. Dietary fibers keeps your gut moving and stops the stasis of food. Moreover, it also helps in better absorption of food. So, if you are looking for a natural source of high fiber and complex carb diet then coconut flour is the right answer. In one cup of shredded fresh coconut (80 grams) there are 3 grams of complex digestive carb and 9 grams of fiber. The remaining 68 gram is water, protein, and fats. So coconut is high in fiber and complex carb contents – coconut contains three times more fiber than carbs. Coconut flour contains even more fiber than fruits and vegetable. It contains more fiber than the similar volume of beans, which contains 7 grams of digestive carbs and only 3 grams of fiber. And in carrot there is 8 grams of digestive carbs and 4 grams of fiber. If you’re thinking of a life hack that might turn the tables around and help you lose a lot of weight then coconut flour may be the best choice you have. But, how coconut flour helps with weight loss? Coconut is rich in indigestible dietary fiber, which leaves your body without adding calories into your body. In addition, high content of fiber gives you a feeling of fullness. This way you eat less. This is important because most of the times, the only reason you might be gaining weight is that you’re eating more than you actually should. Studies have proved that if you are adding 14 grams of fiber in your daily diet, it would possibly help you decrease the caloric intake by 10 percent. This will be certainly of great help if you’re trying to lose weight. High fiber diet like vegetable and coconut both would be great if you want to achieve the summer body you’ve always dreamed of. An adequate level of blood sugar is what keeps you going. Lower your blood sugar levels for one second and see the light fade away in front of your eyes. That’s how important maintaining adequate blood sugar is. But, maintaining blood sugar becomes even more important when you’re suffering from diseases like heart disease, diabetes and other metabolic disorders. In fact, in most of these diseases, aberrant blood glucose is the only known abnormality. The only way you can normalize your body sugar levels is that you eat the “right type of diet”. This is where coconut flour comes in! Carbs make the most of your daily diet. The breakdown or digestion of carbs starts from your mouth and keeps on going till the intestine. The final breakdown of carbs takes place in intestines and from there carbs are taken up into the blood. The meals having high concentration of carbohydrate, like table sugar and refined flour, give a big dose of glucose to your body. If you are not controlling the daily intake of your carbs then the ultimate result for this sugar over-dose would be diabetes. In serious instance you may even end up having a serious heart attack or stroke. To save yourself from the utter wreck, the best you can do it eat less carbs and keep the levels of carbs in your body under check. In normal condition, insulin produced in our body regulates the excess of sugar and prevents it from getting abnormally high. But, there is a limit to which insulin can handle the over-dose of sugar. Once that limit is crossed, even insulin is no longer able to regulate the level of blood glucose and you end up having persistently high blood sugar and ultimately diabetes. Coconut flour makes sure that the sugar content of your body never goes sky high- thanks to its complex carb and fiber content. These constituents make sure that carbs are released into the body slowly and insulin levels stay in moderation. So, adding dietary fibers to your diet is a bright idea, as it will help you manage insulin and blood sugar levels in your blood. A person having diabetes is also recommended to eat foods having comparatively low glycemic index. Glycemic index is a measure through which you can measure the sugar level of your food. Higher the glycemic index, higher would be the sugar content in that food. Not only coconut flour itself has low sugar content, but it also helps with decreasing the glycemic index of other sugary foods. If you add coconut flour to the food having starch and high in sugar, it lowers the glycemic index of that particular food. A study was published in the British Journal of Nutrition in 2003, conducted by T.P Trinidad. In that study both normal and dietetic patients were given a variety of food items to eat like granola bars, carrots, cakes, cinnamon bread and brownies. It was observed that behavior of blood sugar level in both normal and diabetic persons were almost identical due to coconut content in all these food. In other words, if your food has coconut flour in it then it would help normalize the blood sugar level and would not let an abnormal increase in the blood levels of sugar. That study also proved that sweet products like cookies and cakes made from coconut flour have less harmful effects on diabetic patients as compared to cakes and cookies made from white flour. So, diabetics can still enjoy their favorite cookies and cakes by replacing their regular flour with coconut flour. Fiber works like a broom and sweeps out from our body all sorts of parasites, carcinogens and toxins. If you add fiber to your diet, it helps you clean all the toxins from your body that can otherwise stick to your intestine and can cause many problem related to intestine and colon. Colon cancer is the second most deadly type of cancer after the lung cancer. Many researchers have now proved that high fiber diet and colon cancer are co-related, that is, if you add high fiber to your routine diet, you have lesser chance of getting colon cancer. The most extensive study we can refer to inducted over 400,000 people from all over the Europe. That study proved that high fiber intake lessens the chances of cancer up to 40 percent. Another study from Sweden in the University of Lund found that dietary fiber in the diet helps sweep out all cancer causing toxins from the body. That study also proved that various kinds of fiber have the capacity to absorb as much as 20-50 percent of carcinogens out of the intestine. Dr.B.Hershoff from Loma Linda University worked on the study given by Committee on Nutrition in Medical Education. That study comprised of different groups rats and mice that were given with different amounts of fiber in their diet. Some were given a high fiber diet and others were given low fiber. Both types of animals were subjected to same drugs, food additives and chemicals. Results showed that the group of animals given low fiber in addition to drug and chemical developed serious ailments as compared to the group of rats that have had high fiber in their diet. Several studies prove that fiber protects from breast, ovarian and prostate cancer as well. High risk of ovarian and breast cancer in females can be due to unchecked elevation in the levels of estrogen. In early growth of ovarian and breast cancer, estrogen is collected in the liver and is sent to the intestine where it is absorbed by blood vessels from where it is sent into the blood stream. A diet rich in fiber interrupts this process. Fiber in intestine increases intestinal transit time. This means that all the contents of intestine move out of your body rapidly. In other words, the longer the toxins, hormones and chemicals stay in your body, the more likely you’re to get different kinds of cancers. The early different chemicals exist your body, the less likely you’re to get different types of cancer. Coconut flour is rich in fiber and is rated one of the highest fiber containing foods. All the fiber in coconut flour supports your intestine and saves you from cancer. Nutritionists recommend at least 20-35 grams of dietary fiber intake a day. But, the diet of an average individual contains only as much as 10-14 grams dietary fiber. If you are adding coconut flour to your diet, it will add a lot of fiber to your daily diet and will help you to achieve the bench mark of 20-35 grams fiber a day. One of the biggest risk factor for heart disease is high level of cholesterol. Cholesterol is something that clogs your blood vessels and stops the flow of blood in the blood vessels. In fact, high level of cholesterol is the biggest risk factor for potentially life threatening conditions such as high blood pressure, heart attack and stroke. The best way you can stop that from happening is that you add a lot of fiber to your diet. Fiber hampers the absorption of cholesterol from your gut and prevents the buildup in already high level of cholesterol. coconut flour, being extremely high in fiber, is the best chance you’ve at decreasing the risk of life threatening conditions such as heart attack and stroke. You can easily add coconut flour to your diet. Simply add few table spoons of the flour in your smoothies, beverages, baked goods, casseroles, hot cereal, and soups. Although using coconut flour while baking is a healthy alternative as compared to wheat flour, but unfortunately it is not as simple to use. You can’t use the same amount of coconut flour in recipes as wheat flour. Using too much coconut flour doesn’t give the same consistency and taste as does wheat flour. That’s the biggest limitation that you might face while using coconut flour. Coconut flour is extremely absorbent so first precaution you have to take is to put it in airtight container and put that container in a dry and dark place. While making anything using coconut flour, take care that it will absorb all wet ingredients like eggs, milk, oil and water, so what you have to do is to add more water as compared to recipe made with wheat flour. Recipes with less moisture would make you banking a disaster, hard and dry. It is something obvious, but if you do not like taste of coconut than you can mask coconut taste by adding cocoa. And if you are making savory items then add garlic and onion. To conclude, coconut flour has countless benefits for your health. It aids with digestion and helps with even life threatening conditions such as cancer and heart attacks. Therefore, replacing coconut flour with wheat flour is a good option.